Sharon Cuneta revealed on Wednesday that she lost 20 pounds through Marie France Bodyline, which she now endorses, reports ABS-CBNNews.com. 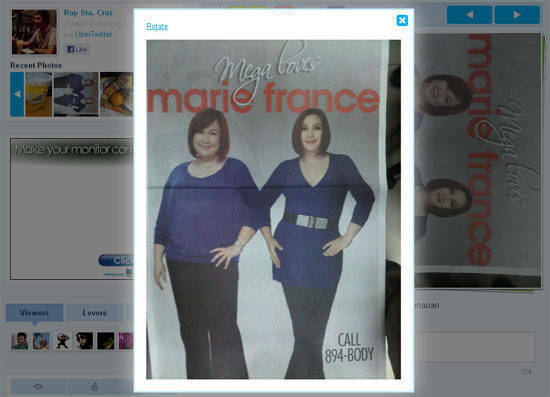 She said the Marie France advertisement showing her slimmer body was not edited or Photoshopped. The Megastar started the slimming treatment in July but she admitted her visits to the clinic have been "on and off" because of work, reports PEP.ph. "I’m going to do this steadily. Not as slow as if I’m going to do it alone... But not too quickly because (that’s not) healthy too." She has tried crash diets and liposuction procedures but because of her midlife crisis and emotional eating habit, she said she lost weight, gained it back, and so on. Cuneta said she is motivated to get in shape. PEP.ph quoted her: "I’ve always wanted to have a nice long walk with my children, not naman marathon... It’s to keep up with them ’pag naghahabulan diyan (when they’re running around). When I tickle them, hindi ako hapung-hapo agad (I don’t want to tire easily)." She added that she wants to get fit for work. "I couldn’t possibly finish a movie if I have no energy."